According to a recently released report by the American Council for Energy Efficient Economy, Pittsburgh and the state as a whole still have some of the poorest air quality in the country. But despite current pollution levels, previous characterizations of the city as a toxic hub, complete with a smog-covered skyline, are increasingly becoming a thing of the past. Pittsburgh businesses regularly win awards for sustainability. And city government has enacted a number of green initiatives committed to improving the environment. 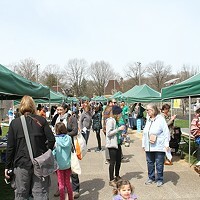 Among them is the upcoming Pittsburgh Earth Day, three days of environmentally-focused events that celebrate sustainability efforts in the city. The annual event kicks off with the Ecolution Fashion Show on Thu., April 19. “It’s one of the most exciting fashion shows that we do in the city because they’re using their creativity, using recycled materials and sustainable materials to create these costumes that are very unique,” says Ronda Zegarelli, president of Acrobatique Creative, the agency that works with the city to organize Pittsburgh Earth Day. As part of the eco-inspired show, designers use recycled fabrics and repurposed materials to construct clothing and accessories. Past materials have include repurposed neckties, floppy discs, soda can tabs, film strips, paper towel tubes and plastic six pack holders. 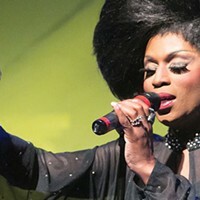 The evening will begin with a spoken-word performance by Vanessa German, and will also include special performances by Miss Thea Trix, Weylin Gomez and Texture Contemporary Ballet. Designers in the show include: Kat Belskey, Terry Boyd, Gina Cercone, Brandon Darreff, Katy DeMent,	Julianne D’Errico, Electric Catfish, Mindy Eshelman, Tom Higgs, Zain Islam-Hashmi, JJ Designs, Lessa Kassler, Victoria Kerestes, Bradford Mumpower, Karen Page, Jen Rocket Studio LLC, Ruby Dawn Designs, Sarah Jane Sindler and Ange Vesco. Models in the show will be styled by Izzazu Salon, Spa, & Serata. “This must-see fashion show is an	eclectic mix of Pittsburgh artists working together to continue the awareness and practice of sustainability. Izzazu is pleased to be a part of this important annual event,” says	Emilio	Cornacchione,	one of the principals of Izzazu. The top four scoring designers will be determined by a panel of five judges and will receive stipends from Larrimor’s clothing store. Judges include Natalie Bencivenga, Pittsburgh Post-Gazette Seen Column editor; Sara Bauknecht, P-G Seen Column editor; Patrick Moore, director of the Andy Warhol Museum; Eric Dorfman, director of the Carnegie Natural History Museum; and Janis Burley Wilson, executive director and president of the August Wilson Center for African-American Culture. Guests will enjoy a complimentary featured signature Pittsburgh Earth Day cocktail featuring Blume Honey Water, hors d’oeuvres and chocolate creations from A519 Chocolate. Pittsburgh Earth Day: From Steel to Sustainable is a citywide celebration of advancements made in sustainability, technology, and innovation in various sectors of people’s everyday lives. The series of events takes place April 18-21.